If you’re not already stalking Carolyn’s amazing recipes and photos… YOU. NEED. TO. RIGHT MEOW. That is an order from the Birthday Bacon Queen (aka, me). Which will shortly be followed by an order for a dozen of these babies. YUM. Guest post by Carolyn Ketchum of AllDayIDreamAboutFood.com! Bacon cups. Edible cups made out of bacon. A stroke of genius, no question. Not my genius, I confess, but genius nonetheless. I’ve seen any number of bacon cups on the internet, filled with various delicious fillings. But I have yet to see them paired with one of my other favourite foods, guacamole. So I just had to. Because bacon and avocado go very, very well together. They need to be put together as often as possible. I have many other ideas for bacon and avocado, which I have yet to execute. But I will. Oh yes, I will. And these little appetizer-sized bacon bites went down like fog. I only made 12. That was stupid of me. Double the recipe if you have more than 3 or 4 people to feed. Triple the recipe, that’s even better. But they are best served fresh, as that darn guac starts to brown if they are left out for more than an hour. 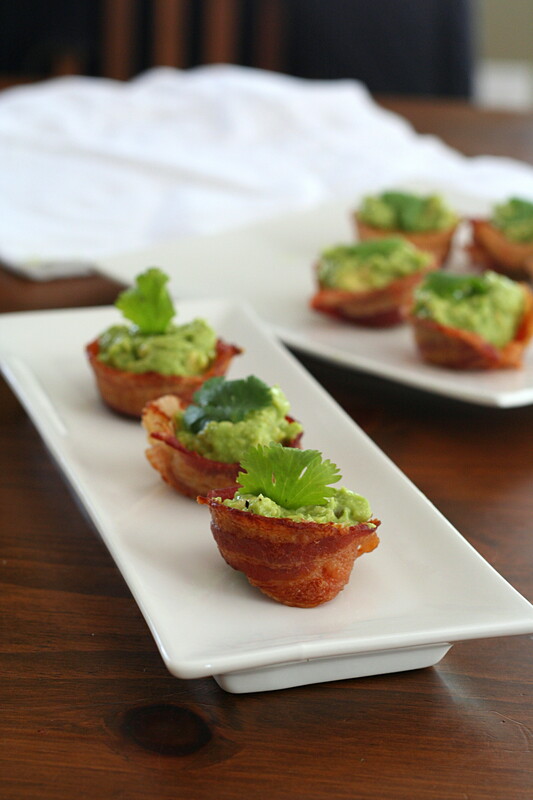 The bacon cups themselves can be made in advance, then filled with guacamole on an as-needed basis. For the mini bacon cups, preheat oven to 400F. Turn a mini-muffin pan upside down and place on a large rimmed baking sheet (you need something to catch all the bacon grease from dripping to the bottom of your oven. If your muffin pan is too big to fit on the sheet, make sure to put one or two baking sheet on a rack below in the oven). Spray the tops of 12 of the over-turned muffin tins with cooking spray (I suggest coconut oil spray). Cut 6 of the slice of bacon in half. Cut the remaining 3 slices of bacon into 4 even portions each. Place one of the smaller portions of bacon on the top of each over-turned mini muffin cups. Take one of longer portions and wrap around the sides of the muffin cups, with as much overlap as possible between the two pieces. Secure the ends with a toothpick. Bake about 25 to 30 minutes, or until browned but not overly crisp (they will shrink too much and be very difficult to remove from the pan). Let cool 5 minutes, then carefully loosen the cups and let drain on a paper-towel lined plate. Meanwhile, in a medium bowl, mash avocado with a fork. Stir in onion, cilantro, garlic, jalapeno, lime juice, salt and pepper. 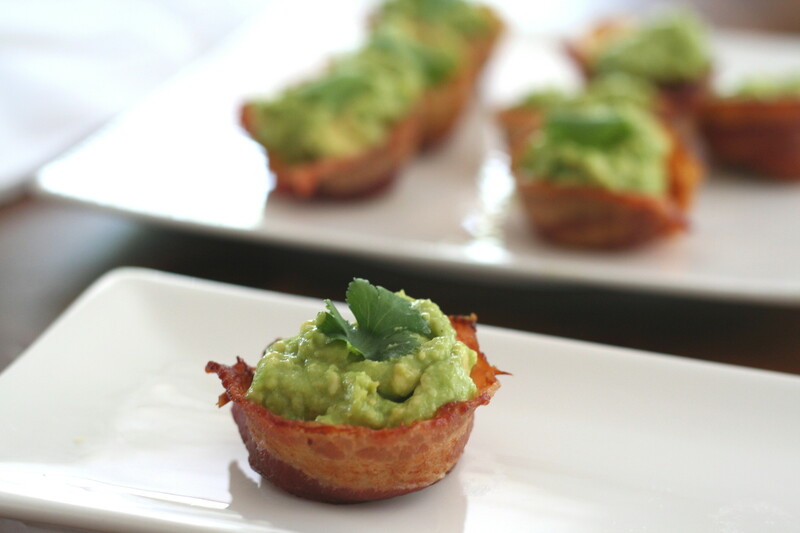 When bacon cups are cool, divide guacamole between them. Garnish with cilantro leaves. Love these, such a good idea. Reblogged this on Luceafar Luceafarul VIII `Lucifer. Genious! I am going to have to try these bad boys this weekend! Awesome! What a great idea for summer barbeques…or anytime! I will be making these this weekend. Wow! Brilliant and delicious! And the bacon bowls are perfect cups for several other fillings too. yes! I’m thinking…. bacon chocolate cups. ha. Happy Birthday! It’s my birthday month too. 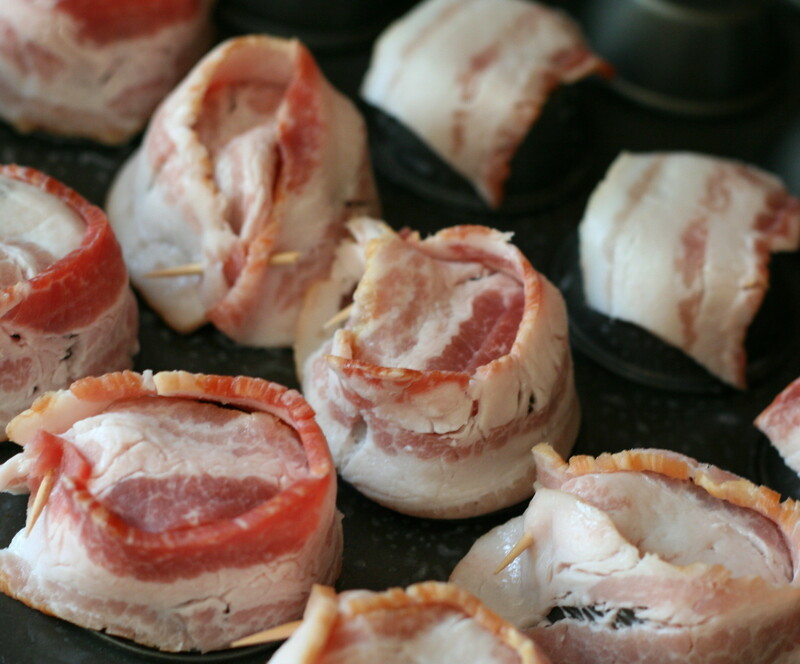 These little bacon cups look positively scrumptious, and I plan on making these for an upcoming summer party. I’m sure that they won’t last long enough for the guac to go brown. I’ll bet that a few pretty sprinkles of cheese would be nice on them as well. the bacon cups are totally cutely delish! you could fill them with (almost) anything! Ooh, possible brainstorm — I like my bacon extra crisp. I’m thinking a minute or so in the microwave (on the paper towel lined plate) between steps 5 and 6 might get it crispier without the sticking-to-the-pan issue. My friend brought these to a girls night and they were delicious! I’m making them tonight for an appetizer for (Canadian) Thanksgiving….yum! woot woot! so happy to hear it! this a dumb question but do you remove the toothpicks after they are cooked right? Made these for a brunch with egg filling, also made as an appetizer with some good old macaroni and cheese filling! Wow. I just had guac and bacon with my Mediterranean scramble this morning, and this idea showed me something neat I can serve at my Easter brunch. I’m doing it!